Highest performance and solids capture to produce reuse-quality filtrate. The Alfa Laval AS-H Iso-Disc cloth media filter enables production of high-purity, reuse-quality filtrate from applications such as tertiary filtration, process streams, surface water treatment and other water reuse. The robust yet simple filter design can handle solids and hydraulic loading with a small footprint-to-flow ratio. Performance of the Iso-Disc cloth media filter is second to none. The cloth media is capable of solids capture down to 10 microns without having to build up a filter mat or require any run-in time. The two-layer pile cloth allows for complete cleaning during backflush, utilizing filtered water from inside the filter plate. If required, the cloth media can be replaced and the filter plate re-installed in a matter of minutes, all while the filter continues to function without interruption. The gravity driven, continuously operating filter uses completely submerged filter media, which gives 100% active filtration area all the time. The outside-to-inside flow through the pile cloth media provides much better depth filtration compared to screens. All internal or submerged components are corrosion-resistant stainless steel or non-metallic materials. For retrofits, the square or rectangular filter plates easily fit into existing basins and require only a low driving force of 30 cm water column. Use of the fixed-filter media design reduces overall horsepower and permits removal of each individual filter plate while the filter remains in operation. During backwash, the filter plates remain fixed while the dynamic, bi-directional, linear backwash manifold serves as a header for removal of solids from the pile cloth media. At the beginning of the backwash cycle, which is initiated by headloss across the filter, electrically actuated valves segregate the backwash header and clean the filter plates on that portion of the header. This ensures complete cleaning of the filter cloth while minimizing the rate at which backwash water is returned to the treatment facility. The Iso-Disc cloth media filter can be installed into a concrete structure (supplied by others), pre-fabricated carbon steel with epoxy coating, or stainless steel tanks. 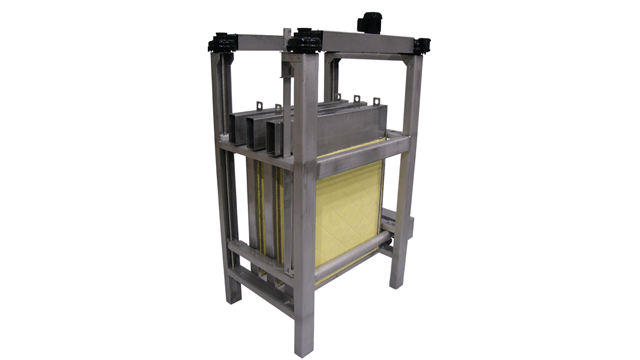 A unique advantage is incorporated into the Iso-Disc design that allows filtrate isolation and sampling from each filter plate individually, as well the ability to remove an entire filter plate from the system without filter shutdown. The design also eliminates rotating underwater seals thereby ensuring filtrate quality, while guaranteeing no cross-connection between influent and filtrate, and requiring less maintenance.